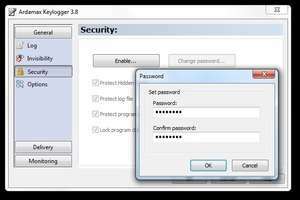 Ardamax Keylogger Lite is a flexible, freeware keylogger which will capture user activity (on the PC where it has been installed) and save the information to a log file specified. You can use the program to figure out what has been happening on your PC while you've been away. It will also maintain a backup of data typed automatically. You can also use Ardamax Keylogger to monitor your children or cheating spouse. Ardamax Keylogger 4.6 is a shareware program and can be used as a demo to try the software until the free trial period has ended. A full version of the program is available after the trial period ends. For security reasons, you should also check out the Ardamax Keylogger download at LO4D.com which includes virus and malware tests. Additional screenshots of this application download may be available, too. 4.77 out of 5 based on 18 ratings. Ardamax Keylogger Lite has a presence on social networks. Ardamax Keylogger Lite download been highly rated by our users.